Scotland’s national animal is actually a unicorn which isn’t even a real animal. But why is Scotland’s national animal a unicorn? The unicorn is a symbol of purity and grace. 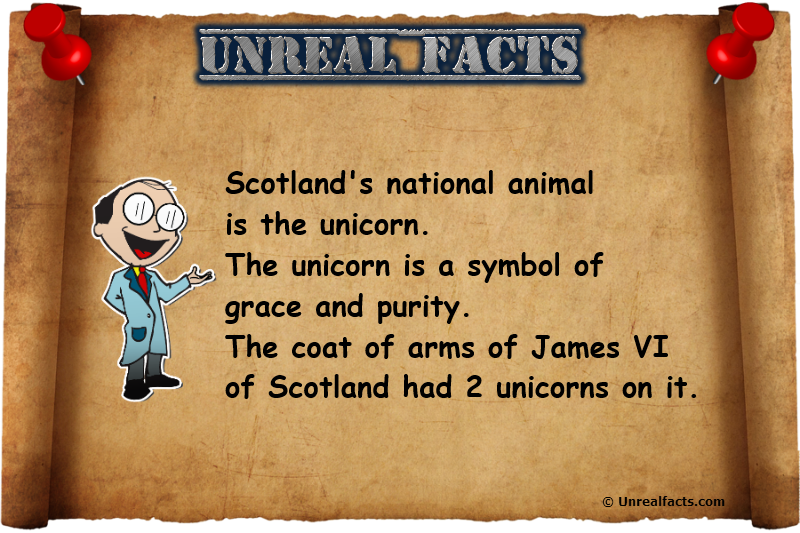 The coat of arms of James VI of Scotland had two unicorns on it. But come on. It’s a creature of myth and legend. Are the Scots breaking the rules here? Well, not really. There aren’t even rules to break, and both Singapore and North Korea also have make believe beasts as their national symbols. But even with these three odd examples, nothing even comes close this. Let’s explain the reasons behind Scotland’s zany national symbol. Like many countries around the world Scotland actually has two national animals. While the most notable one is the unicorn, the other is the red lion. Yeah, there’s no mistake here. One is not real, the other isn’t a native to the country. When he became king of both Scotland and England following the death of Queen Elizabeth I, James I combined the unicorn with the lion on the coat of arms. This was a powerful symbol as it was regarded that the lion and unicorn were mortal enemies. It was no secret that Scotland and England had a frosty relationship. For those who don’t know, the unicorn is a mythical horse-like creature that has a horn protruding from the center of its head. It has been said that it possesses magical abilities, is a symbol of purity and grace, and can only be tamed by a virgin. Some have even said that the horn can render poisonous water potable and heal the sick. It is little wonder that when choosing a symbol for their country that Scotland settled on the unicorn as its national animal. It is common for countries to adopt a national animal that is synonymous with their identity or is a native animal of that country. In this case, a mythical creature was more fitting than a real one, as it enshrined many of the features and standards that Scotland hold high. Please, don’t anyone tell the Scottish that the unicorn isn’t real or the red lion isn’t native to the British isles. Scotland isn’t the only country with a weird national animal. A few countries, and even at least one city have odd symbols of identity. North Korea has one creature that is comparable to Scotland’s. You can check it out by visiting this link. But North Korea is known for being, let’s say eccentric. Singapore, on the other hand, has a creature that it somewhat more terrifying than either Scotland or North Korea, and it too is as real as Leprechauns. If you enjoyed reading this, feel free to watch our very first YouTube video below. It has this particular fact in it along with four others. singapore’s national animal is a lion mermaid. She wasn’t after purity an grace she was after!!!!! !